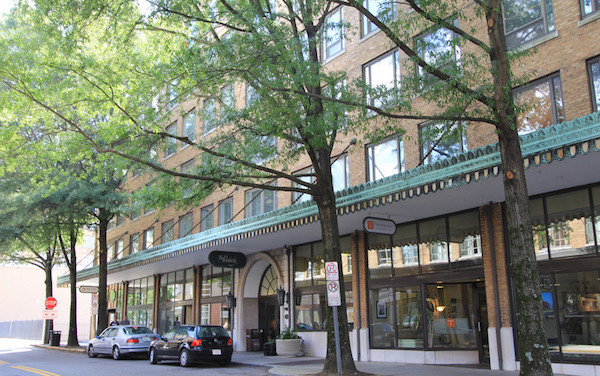 The Pembroke is conveniently situated among the eclectic shops and restaurants of charming Union Avenue and just one block from bustling Market Square and the YMCA. Highly regarded for its fine and unique amenities, The Pembroke offers garage parking space, a rooftop swimming pool, and concierge services. This bright residence overlooking Union Avenue features two deeded garage parking spaces, expansive windows throughout, beautiful hardwood floors, generous storage and a welcoming great room. All amenities, water and basic cable are included in the monthly HOA fees. Square footage provided per seller’s floorplans and is an estimate only. Buyer to verify size. Location: Traveling South on Gay Street, just before Regal Cinema, take a right onto Union Avenue. Pass Market Square on the right and cross over Walnut Street. The Pembroke is located on the left across from Union Avenue Books and Just Ripe market/cafe. Street parking may be available, or continue straight, take a left onto Locust Street and turn left into the Locust Street Parking Garage where nights and weekends are generally free to the public. If driving west on Summit Hill Drive, take left onto Locust Street and then a left onto Union Avenue. The Pembroke is on the right, just beyond Pete’s diner.